Fun for the whole family awaits at Black Mountain’s dazzling new Water Park. The Black Mountain Water Park Hua Hin is spread over 40 000Sqm and is situated a short distance from the center of Hua Hin, just 15 minutes from town. It opened in 2011 and it is one of the most favorite tourist attractions in the region. With capacity for up to 1500 people, it is one of the largest and most modern in Asia. The focal point is a 17-meter tower from which nine water slides, a spectacular wave pool which is making the biggest wave in Thailand, the lazy river, a beach/infinity pool and children’s pool, all providing the best fun filled day out a family can have. 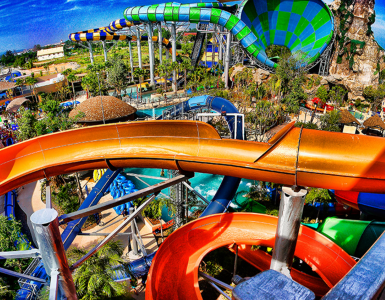 The Black Mountain Water Park Hua Hin is one of only six of its kind in Thailand. A cable system pulls riders at 30 kilometers an hour and can accommodate up to eight wakeboarders at one time. The 800-meter-long area features two jumps and two sliders that provide a full opportunity for participants to practice and show off their skills. Black Mountain Water Park Hua Hin is full of high quality, modern equipment that is all operated in line with the highest safety standards and supervised by highly trained lifeguards. Tourists and local residents have been extremely complimentary about the good times spent on the many exciting attractions.